A Day Well Started is a Day of Power. Frank Lloyd Wright was never seen working during the day. A friend of his observed that he could be seen taking phone calls and meetings, answering letters, and working with his students, but she never saw him at the drafting table. When she asked the prolific architect about where all his work came from, he confessed he did most of his work between 4 and 7 in the morning. Many people have found that early morning hours are the best time for creative pursuits, because the waking mind is closer to the subconscious than during any other time of the day. Many others use the pre-dawn hours for a daily practice that enriches and rejuvenates them all day long, such as exercise or meditation. If you woke up one hour earlier each morning, you would gain 15 more days each year. Set aside time for something you really love to do. Something you don’t often have time to do during the rest of your day. Something that makes you really look forward to waking up. If you wake up to do chores and things you think you ‘should’ do, your sapped early-morning willpower will not be sufficient to get you out of bed. Anticipation of something exciting, something you really look forward to, can help propel you out of bed. Make a list of everything you could do in the morning, and the number of minutes you want to set aside for each activity. Total them up. 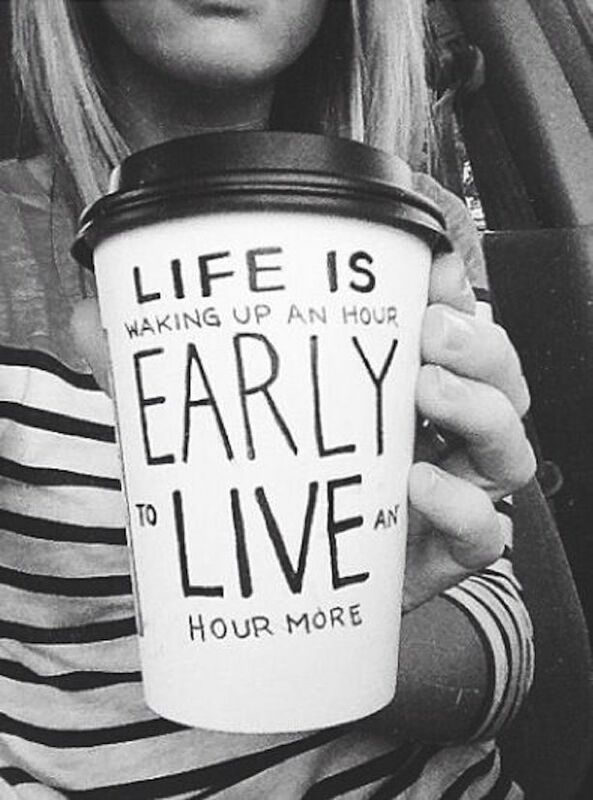 How much time is needed for a great morning routine? What time would you need to wake up to do everything on your list? If this wake-up time is too early, cut some activities and schedule out an entire morning routine, full of things you love to do. Assign a favorite song to each activity in your morning routine. If you want to spend 30 minutes running, put together 30 minutes of great running songs into a playlist loaded up on a portable device. Include a five minute song you always listen to while you warm up and stretch. When you wake up in the morning and hit play, your body will follow the subconscious instructions provided by the repetition of the song. If you can roll over and hit snooze, you’re much more likely to stay in bed than if you have to get up and cross the room. Once your feet are on the floor, you’ve already got momentum, and that will keep you awake. The app Step Out Of Bed ($1.99 for iPhone) will continue ringing until you take 30 steps. Another useful iPhone app is SleepCycle (also $1.99) which will track your movements, if you have the phone next to your bed. It will begin playing light music when your sleep cycle is the lightest, and the alarm will go off when it determines your brain is most ready to wake. Due to the cycles of our brain during sleep, we go into and out of periods of deep sleep approximately every three hours. Sleeping 3 hours or 6 hours is much easier than sleeping 4.5 hours – waking up in the middle of a sleep cycle makes you groggy and disoriented, but your brain naturally returns to a theta state at 3 hour intervals, and this is the best time for you to wake. If your spouse, roommates, or neighbors want you to stay up drinking on a weeknight, it’s harder to stick to your early rising habit. Especially when you’re first getting a new routine going, their support is crucial. Tell everyone you see late at night and early in the morning about your morning routine, ask them for their support, and work out any logistics in advance. Exercise is one of the best components of a morning routine, because it naturally wakes your body, and the endorphins released put you in a great mood. If you are already active, you know that exercise is its own incentive; but even if you aren’t in great shape right now, a brisk walk around the block or some light stretching will brighten your mood, and you can take that happy feeling with you all day. 9. Turn off your screens an hour before your scheduled sleep time. The wavelengths of light coming from your smartphone, television, or computer are similar enough to daylight that your brain stays artificially alert. Stopping screen time for the last hour of your day will help you to transition into sleep quickly, instead of laying awake in bed, and robbing your body of sleep. 10. Reward yourself for waking up early. What could you do in the morning that would really make it worth the effort? A quick drive to get your favorite breakfast? A subscription to a new magazine that you only read in the pre-dawn hours? A new journal or yoga mat? Give yourself a reward for doing behaviors that are good for you.